If you’re someone who values organization, like me, but doesn’t always excel at it, a good handbag is essential. This modern Samsonite Karissa Handbag is a frustration free organizer bag crafted with a boat-load of compartments and pockets. Keep your things neat and tidy while still looking stylish. Along with other features this bag is a well-made piece of travel gear made for women on the go. Read on to explore the Samsonite Karissa Handbag many winning features. 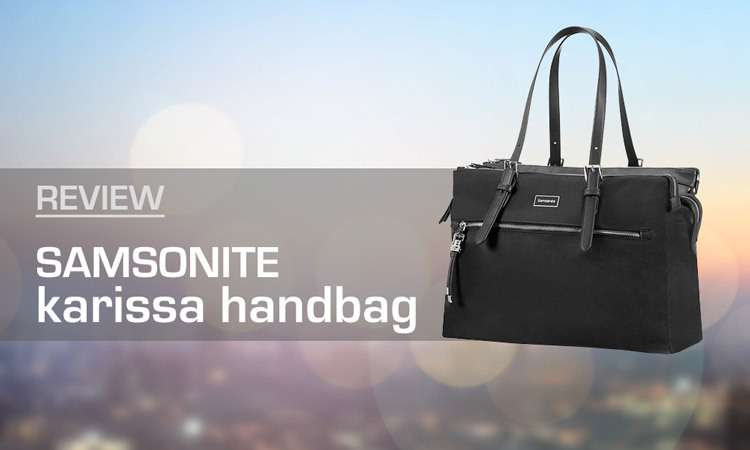 This lightweight shopper bag from the Samsonite Karissa Biz line is made for women. At only 2 pounds it’s great for packing daily essentials for regular use or for travel. The material is nylon based so it’s easy to clean and wipe down. It has an expensive, modern look, while still remaining practical. Two durable thin straps are well stitched so you can tote this bag without any strap breakage. The straps are also adjustable for customizable length. 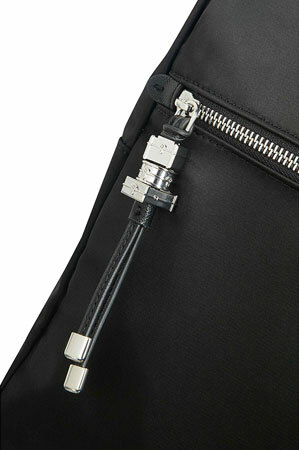 A front zipper pocket is provided for easy access, as well as a back hidden pocket. As with most Samsonite bags, this beauty has a smart sleeve so it can be easily topped on your roller luggage for convenience. 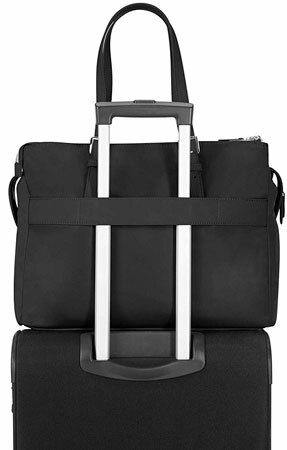 The Samsonite Karissa Organized Shopper comes in two classic colors. Black, with silver hardware, and light taupe with gold hardware. Both colors are very versatile and practical. 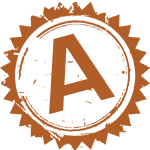 The light taupe is a refreshing change from your typical blacks or greys. It’s a look excellent for all seasons. Pockets, pockets, pockets. This is a bag excellent for teachers or business women. 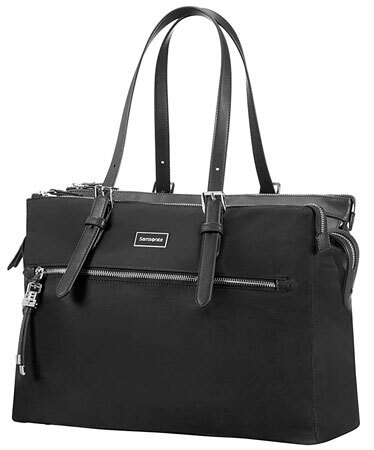 With endless organizational options, the Samsonite Karissa Biz Organized Shopper is super practical for everyday use. All your devices can be accommodated with a dedicated laptop, tablet and phone pocket. On top of that, there is ample room for your regular essentials like, notebooks, writing utensils, books, files, and even a change of clothes. Three main pockets divide your belongings according to your preference and taste. Each is zippered so nothing goes flying out even if your bag spills over, or is placed in an overhead compartment or under a seat. Since the Samsonite Karissa line is a relatively new line from Samsonite there are not many reviews online. However, this shopper is crafted from high quality nylon fabric and appears to hold up to the Samsonite reputation for quality durability. The exterior is very sturdy. This bag is very unlikely to rip or tear because of the nature of the material. It’s also water repellent and easy to wipe down and clean. This is a shopper bag with the Samsonite guarantee. It’s a good chance you’ll be able to use this bag for years without it breaking or wearing out on you. As with most Samsonite products, this bag is pricey. At $150, depending on the deal, it’s in the higher priced category of luggage carry-ons. However, remember it’s a Samsonite, a company well-known for their long lasting quality. So if you’re ready to commit to a long-term bag for regular daily use, or you have a little extra cash to throw at a bag, this one is unlikely to disappoint. What a great gift this convenient bag would be to a special lady in your life! I would definitely buy this for my best friend who is a attorney. I really can’t say anything negative about this bag, but that’s a little pricey. And honestly, the organizational potential you have here makes this bag from Samsonite is a great buy. It’s also a simple, clean looking bag with contemporary style making it versatile and appropriate for all seasons. The durability guaranteed with a Samsonite makes this shopper bag a worthy investment for long term use. Although it’s pricey, the quality and design is something you can depend on. 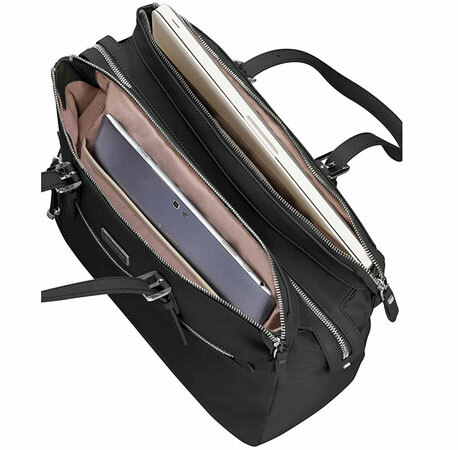 The Samsonite Karissa Handbag is found on Amazon and would be a very useful companion for a teacher or business women.